Movie studios use trailers and sneak peeks to bring more attention to their upcoming theatrical releases. As a vlogger, you can incorporate similar tactics to promote your next video. Here are a few ways to tease your next video and get more views. 1. Create a trailer to give viewers a sneak peek at what’s to come. Like a movie, YouTube videos can be advertised with teaser trailers. Edit together a short trailer that hints at what your video is about but doesn’t give too much away. Trailers work especially well for longer videos or series. Shane Dawson teased his upcoming docuseries featuring controversial vlogger Jake Paul by uploading a short trailer. 2. Give your video a premiere date. Movies fans always know at least several weeks in advance exactly when a new film is coming to theaters. Set a premiere date for your video. Let your viewers know through social media posts, banners, or a special hashtag. 3. Share behind-the-scenes secrets on social media. Before a new Hollywood movie comes out, the stars go on a press tour to talk about their film. Since you can’t tour the country to do interviews about every new video, use social media to share a few behind-the-scenes facts instead. You can post pictures, describe how you felt while filming, or let your followers in on an inside joke. James Charles told his Twitter followers how he felt about his upcoming video. Movies aren’t the only entertainment viewers are after. Utilize a few Hollywood movie marketing strategies to advertise your next video to a larger audience. Real views by real people. Hello am interested in promoting my videos but i don’t have money so pls subscribe to this channel bellow. Promolta is a self service advertising platform to promote videos in targeted blogs, websites, mobile apps and social networks. 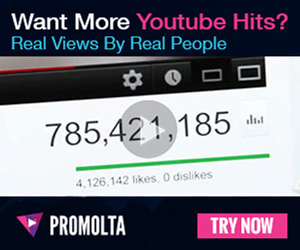 Start your YouTube promotion at promolta.com and get seen today. Copyright © 2019. Made With Love By Promolta.